F&W sold 6 boot scrapers, and Coffee pot sold 2, so I re-stocked both. Speaking with Kevin (who was changing a spring on the 8F) it seems that it is not possible to obtain the correct grade of steel for making loco springs these days. He said that it is the new springs that keep breaking; the old springs are fine. The new springs keep going back for repair under warranty, apparently. 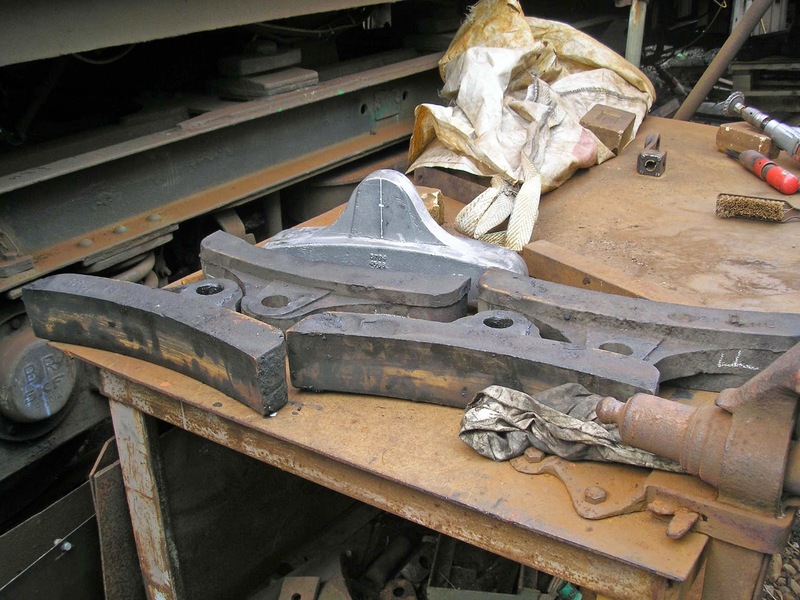 Seems to me that there's a wonderful opportunity for someone to start making loco springs with the right material - surely, there is enough demand in our heritage industry? 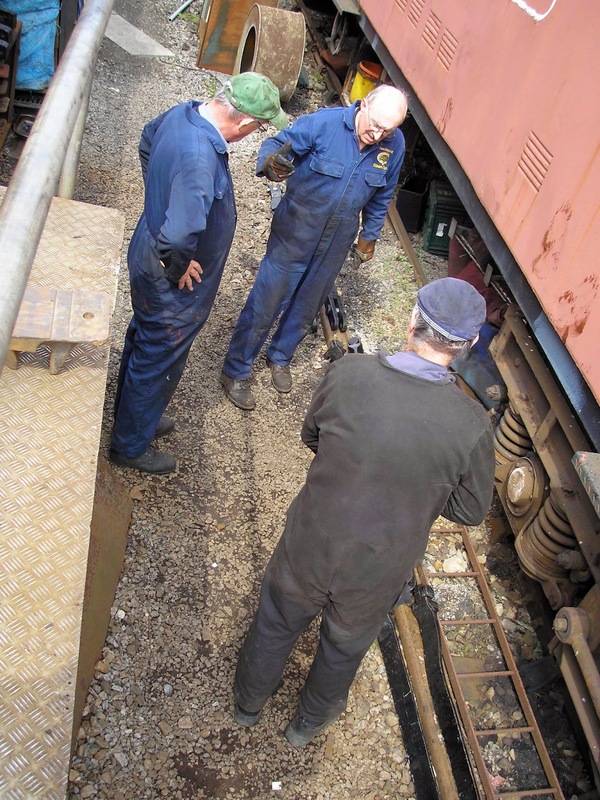 Bruce & Geof were contemplating the loco brake linkage spacing. The brake shoes on one side are relatively new, but on the other side they need replacing. Newly cast brake blocks do not have the pivot hole drilled out (see photo). You would expect that it is in a fixed and central position, wouldn't you? Well, it should be! But guess what … The old blocks are well worn, but not equally so. In fact, there's 1/4 inch difference. This means that the closest block will touch the wheel, and the other will not (well, not immediately, anyway). There is no adjustment on the linkages between the wheels, on our loco. So, how can there be such a difference? Surely they will all wear equally? Unless … the linkages might not be the correct length. They should match the wheel centres, of course, but suppose they don't? Bruce & Geof got all of the linkages out of the shed and laid them down to measure. Could they identify the problem? See photo! They decided that they couldn't measure accurately enough without having the loco there. You see, if the brake hangers are not all suspended at exactly the same distance relative to the axle centres, then the brakes would hang differently, which could account for the difference. It was Mike W's birthday, so he brought us some cakes for pud. Very kind. Geof went home for lunch, so missed out, initially! Bruce & I did our best, but there were just too many! So, Mike said to take some over to Fred & Gil at Winchcombe (which I did, later). While they were all playing with brake linkages and debating if anything could be done, I pressed on with boot scrapers. P.Way arrived with a fresh pile. They were working just round the corner, so brought round some BR(W) and GWR chairs for me! 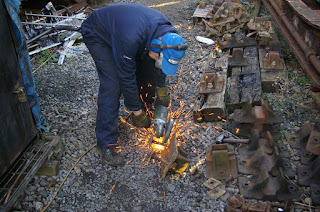 A visitor asked what I was doing, and when I explained, he commented that the Forest of Dean Railway sell boot scrapers for £35, or £30 without the brush! Now, remind me who it was that used to work in our group, but migrated to the Forest when 2807's restoration was complete …. Just me, today. That is to say, Steve popped in for lunch, but as I had decided to go home after lunch, there was not a lot he could do. It was too nice a day to spend it all boot scrapering. I just painted a couple of chairs and a couple of dozen brushes; had a natter with Steve and then buzzed off home and got the bike out for a spin. P.Way were working nearby, again, and donated a dozen more chairs - mainly GWR ones. Still no news about when 2807 will be ready to collect from Tyseley.